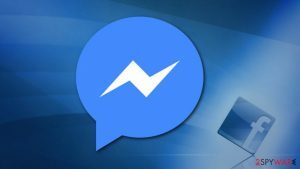 Facebook Friend Request virus is a malicious application message that sends friend requests to strangers without user's permission and with questionable purpose. In addition, scammers might be using your public photos and posts to create a fake version of your account and use it to contact your real friends with the intention to swindle money or personal information from them. 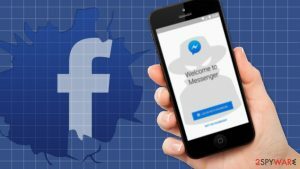 If Facebook sending friend requests issue has been bothering you for a while, you have been involved in the malicious scam associated with these request messages. 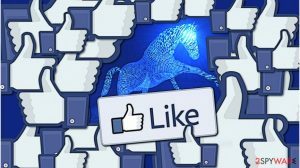 The “Friend Request” virus belongs to a huge malware category known as Facebook virus and it is used to scam inattentive social media users by sending out friend requests without one's knowledge or permission. There was increased activity of Facebook Friend Request virus in 2017 according to experts. However, in the beginning of 2019, we can still see how active this issue is. The techniques used by scammers hardly changed – they either create fake profiles or malicious apps to send friend requests and scam users or their friends. As always, the primary purpose of these fraudsters is to swindle money or take control over someone's account. Typically, the reason to hack accounts is to collect personal information or use it for further distribution of malicious links. The viruses and scams associated with suspicious friend requests on this giant social media network can be divided into several categories. Let's review each of them to learn what to expect from them and how to avoid or remove Facebook Friend Request virus. 2018 came with more news about this virus and a few other versions of this malware that include “Hi….I actually got another friend request from you yesterday…which I ignored so you may want to check your account…” message. This particular October version even raised the attention of the officials of Homeland Security and Emergency Preparedness Office. Otherwise, you become one of the reasons why the hoax is spreading so fast. And people still do get hacked. It urges you to forward it to “all the people you want to forward to” – which many take to mean all their friends. Recent Facebook Friend Request virus version even raised the attention of the officials. Is Facebook sending friend requests without your knowledge/permission? If yes, it is clear that your account is unprotected and someone has permission to add new friends on your behalf. In most cases, the culprit is a malicious app that asked for such permissions before you started using it. You may have given the app the permissions without actually reading them – it happens quite often. If you are looking for a solution to “Facebook adding friends for me” problem, we can provide one. To stop the social network from adding friends for you, you must delete the app that has permission to add new friends to you. We provide a method that helps to revoke app permissions using the web, not a mobile app. Click on the small arrow in the top right corner of the screen on the blue Facebook toolbar. Select Settings. Now, look at the left side of the screen and find Apps section. Click on it. This will take you to App Settings. Here, you will see a list of apps below “Logged in with Facebook” section. Click Show all to expand the list. Hover your mouse over suspicious apps and click on X that appears next to them. You can also choose to delete all activities (including posts, photos, and videos created with or posted via the app). Click Remove to confirm. Repeat until all suspicious apps are gone. This deceitful technique relies on fake Facebook accounts that are created using real photos of a certain Facebook user. 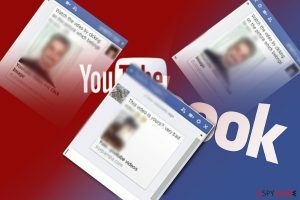 Scammers track down a person that posts content publicly and steals private photos from him or her. They create fake accounts and post pictures and even copy-paste original status messages posted by the victim. All of this is done in order to make an illusion of a real Facebook account, which scammers later use to mislead victim's friends and swindle money from them. Typically, scammers create software that sends out friend requests to all victim's friends and later on send delusive messages asking to lend money. What is more, such Friend Request virus can send a malicious link to victim's friends, asking them to click on it and see something interesting. 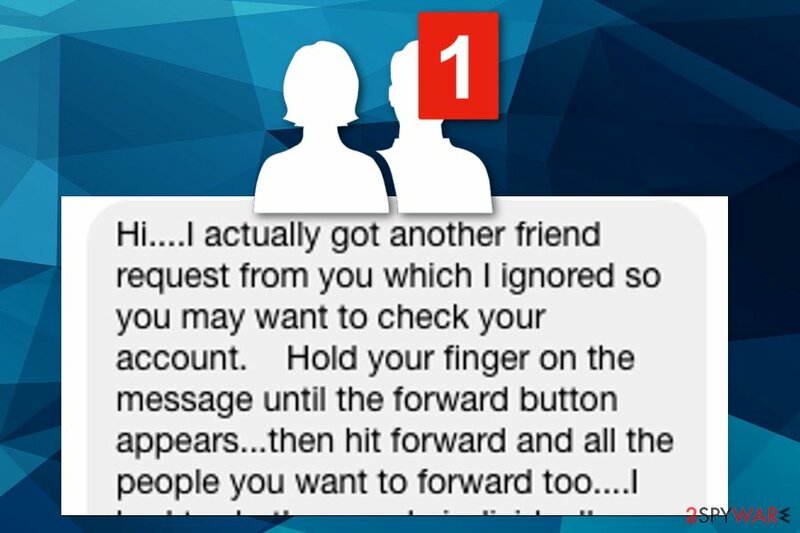 This trickery is quite efficient because the victim's friends trust the real person and want to see what they share. However, clicking on such links is highly dangerous, because these sites can be filled with malicious content. Deceptive websites seek to force users to provide sensitive data or install harmful programs, so be careful! If your friend ever sends you a message with a link to a suspicious website, ask him or her if the website is trustworthy. Facebook Friend Request is a social media hoax that targets users' accounts and sensitive information. Typically, scammers do not reply, but even if they do, we suggest you check the profile of your friend – enter the name of him or her into Facebook search and see if it finds one, or two same profiles. 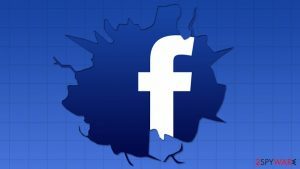 The most obvious sign that you are dealing with Facebook Friend Request malware is that the person who has just sent you a friend request already sends links inviting to explore some suspicious websites or give money. This virus raised awareness again when the news came about suspicious message and friend requests in fall of 2018. 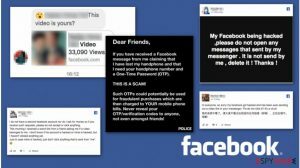 Facebook Help Community even published a post about the version and warned about strange activities on the social platform. The more recently discovered campaign delivers hoax messages directly to users and the profile gets affected this way. 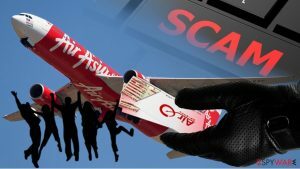 As a consequence, such malicious software can steal access to your social media account and use it to spread malicious messages to your friends and post deceptive posts on the timeline. In such case, react if any of your friends report this to you. In addition to that, this type of virus can unblock contacts that you have blocked and added them to your friends again. To fix this, scan the system with anti-malware tool like Reimage and remove Facebook Friend Request virus immediately. You can use different anti-malware software for its removal, for instance, Malwarebytes MalwarebytesCombo Cleaner. After that, remove unwanted contacts manually. Facebook Friend Request virus is a term that covers suspicious or illegal activities on this social media platform regarding friend requests. If you receive suspicious friend requests or if your account automatically sends them to strangers, you might be infected with a virus. The virus attacks Facebook's users via instant messaging. You may receive a misleading message that looks like it belongs to your friend and offers to click on a link in order to see a picture or watch a video. 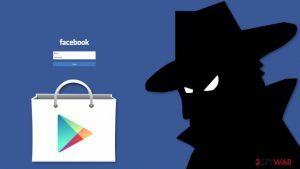 Besides, clicking on every app on Facebook may also lead you to the infiltration of this virus because they are hacked by cyber criminals quite often. Once the virus is activated, it starts sending the requests to unfamiliar people and may also start accepting all pending friend requests that you ignored previously. We also want to warn you that Facebook is not an entirely safe place, and there are some minor adjustments you can make to protect yourself and your friends. First of all, we strongly recommend you to make your friends' list private. If it is public, scammers can easily access it and send deceptive messages to them while pretending it is you. Besides, it is advisable to keep sensitive information private. If you can, make your photos accessible for friends only, too. 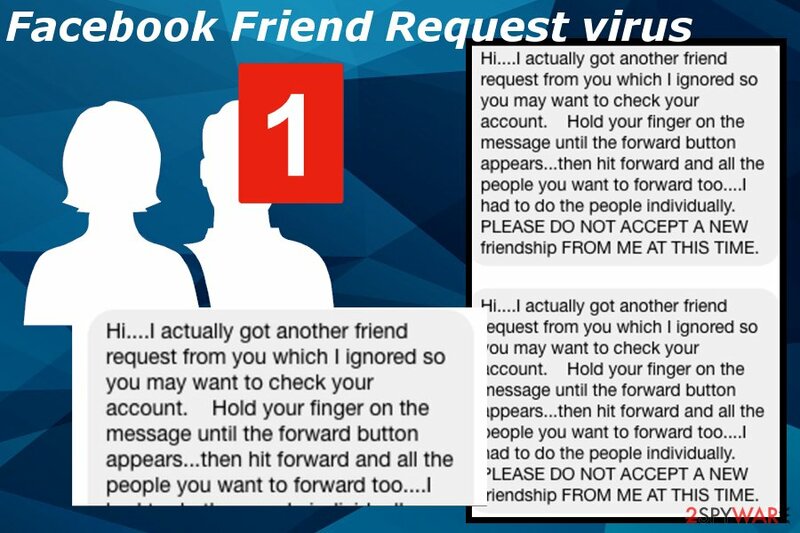 The newest variant of Facebook Friend Request virus came out in October 2018. Question: I think that Facebook is sending friend requests without my knowledge. How can I stop this? I used to delete the sent requests manually but more and more appear every day. There must be a method to put an end to this! Answer: Dear visitor, there are two things that you need to do to stop the social network from automatically sending friend requests and ensure that it never happens again. First of all, you must revoke permissions from malicious Facebook apps and then scan your computer for malware that you may have installed lately. Use the tutorial provided by us to secure your account and remove malware from your PC. 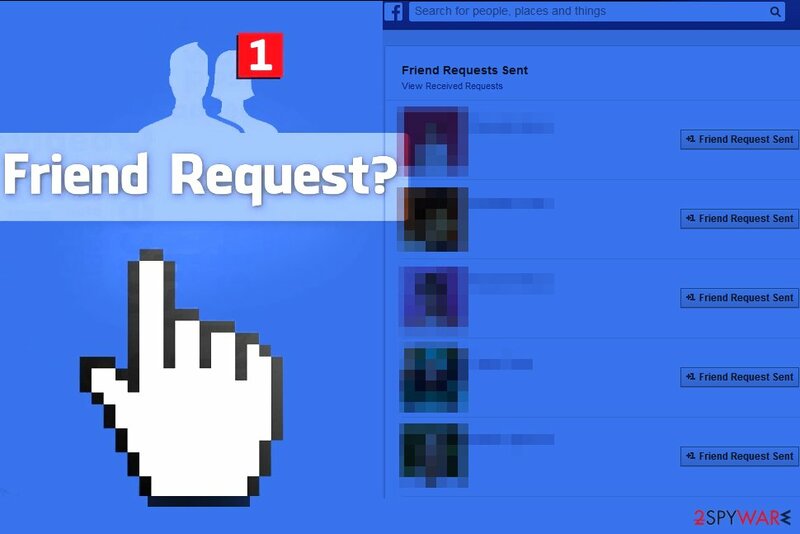 Question: I keep receiving random friend requests on Facebook – is that a virus? How can I know if my account is secure? Maybe my profile is included in target lists for scammers? Can you help me to figure this out? I once received a request from someone who was using my pictures! Answer: Dear visitor, everyone receives random requests from time to time. You shouldn't worry too much about them – just ignore them or reject them. However, the fact that you received a friend request from a “fake” you indicates that your content is shared publicly and you need to take certain measures to protect it. We highly recommend going to Facebook Settings > Privacy and change the Who can see my stuff? settings from “Public” to “Friends Only.” You can also limit the audience for posts that you have already shared. 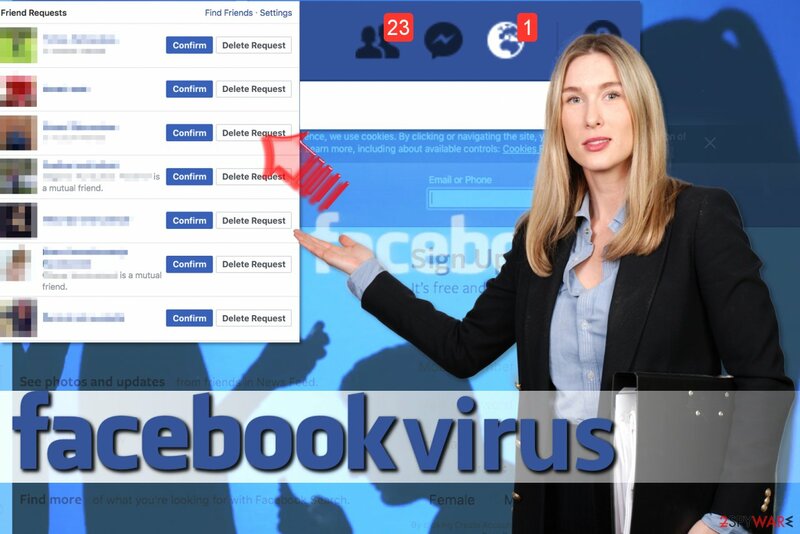 If you notice strange people popping up on your friends list out of nowhere, or if you see that something suspicious has been posted on your wall without your knowledge, it can be a sign of Facebook Friend Request virus' presence. As we have already mentioned, you should revoke app permissions using the tutorial we provided and then check your system for malicious or spyware-type programs that might be illegally controlling your account. In addition, you must change your Facebook's password. However, you should do this after Facebook Friend Request virus removal. Clean the system further using Reimage, Malwarebytes MalwarebytesCombo Cleaner or Plumbytes Anti-MalwareMalwarebytes Malwarebytes, in case this malware added other malicious or possibly dangerous programs or files to the system. ^ Graham Cluley. I accepted a fake Facebook friend request, should I be afraid?. Sophos - Naked Security. 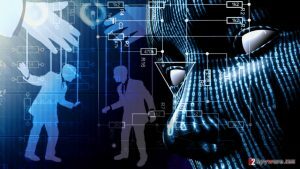 Computer Security News, Opinion, Advice and Research. ^ Aaron Brown. 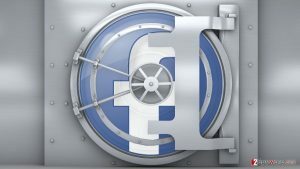 This TERRIFYING new Facebook scam lets hackers clone your account and STEAL money. Express.co.uk. Latest UK and World News, Sport and Comment. ^ Usunwirusa. Usunwirusa. The latest virus news. 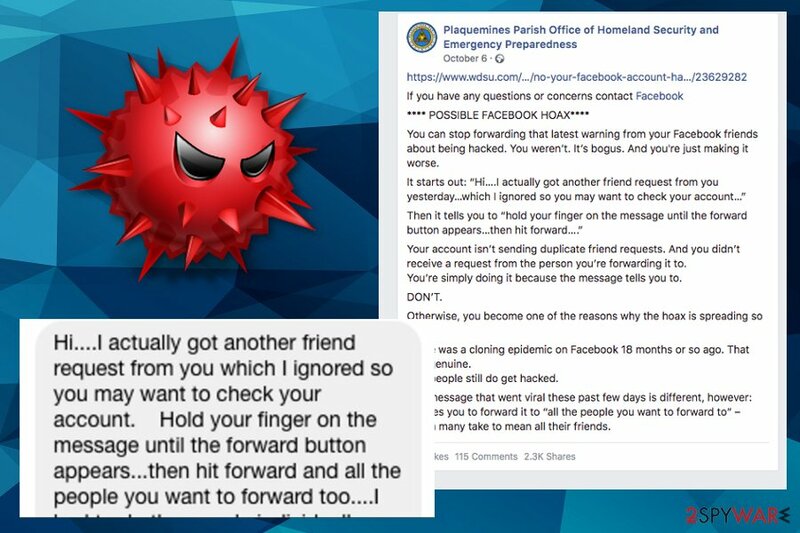 ^ Viral Facebook hoax messages prompts warning from officials. CBSlocal. Baltimore news. ^ The official Facebook post. Facebook. Social media platform. This entry was posted on 2019-04-01 at 00:26 and is filed under Malware, Viruses. How did you remove Facebook Friend Request virus?